What is the Global Business Matrix? 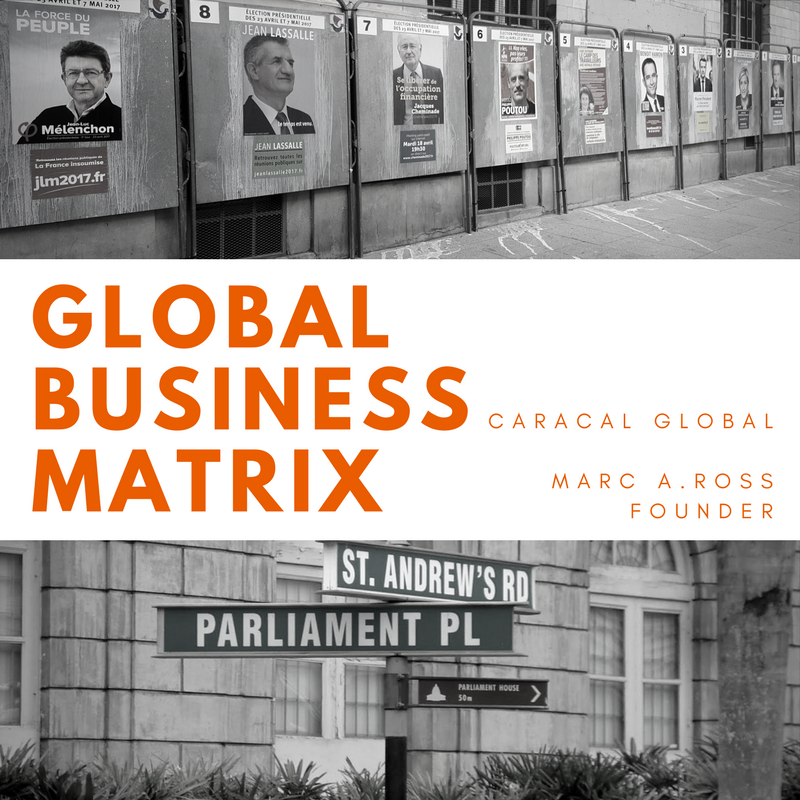 The Global Business Matrix was created by Marc A. Ross for Caracal Global to help multi-national organizations, nation-states, and global investors analyze market moving events shaped by public affairs, political events, and/or regulatory policies. It is important to note these market moving events may have an immediate impact or financial result. However many of the topics could be issues, challenges or opportunities that will be years in the making. Regardless, items identified in the matrix are deemed to be market moving events that will create wealth for some or lose wealth for others. Designed on a weekly basis, the Global Business Matrix serves seniors executives of multi-national organizations, diplomats of nation-states, and individual global investors seeking to ensure appropriate resources are allocated to maintain or expand marketing, investment, public affairs, government relations and management assets. Big Noise - Big Deal (upper right) = Market moving events shaped by an overwhelming number of factors often involving the full spectrum of public affairs, political events, and regulatory policies. Many items listed in the quadrant are evident to the most experienced global investor and top-flight global business executive. Little Noise - Big Deal (upper left) = Market moving events shaped by a few factors often involving two or three elements of public affairs, political events, and regulatory policies. Many items listed in the quadrant are not evident in the short-term and generally, should occupy the most attention for medium and long-term planning and management purposes. Little Noise - Little Deal (bottom left) = Market moving events shaped by a few factors often involving one or two elements of public affairs, political events, and regulatory policies. Many items listed in this quadrant are interesting and should be on the radar in the short-term. Items listed here generally secure limited news coverage and should serve as a guide to consumer market and/or political trends. Big Noise - Little Deal (bottom right) = Market moving events shaped by a few factors often involving one or two elements of public affairs, political events, and regulatory policies. Many items listed in this quadrant are not unusual and should be on the radar in the short-term. Items listed here generally secure breaking news coverage, however, could be potentially distracting to more important developing consumer market and/or political trends. For the latest version of the Global Business Matrix by Caracal Global click here.